Here is a short summary about the presentation. Our session that was accepted for the upcoming AASLH conference is about our public history project for Delaware County PA. This session is called Beyond Colonial: Expanding Stories, Promoting Revitalization. We were so pleased to win the Grand Jury Prize from the Preservation Alliance for Greater Philadelphia for this project in May this year. The just-completed Delaware County (PA) Public History Study’s main goal was to identify needs of the 80 county history organizations, and encourage collaborative projects, including expanding the county’s interpreted history beyond the Colonial era. The study’s research identified that 77% of the organizations are still run solely by volunteers, so technical assistance and networking were tools used to encourage tourism product development (new tours and joint programming) as well as neighborhood revitalization. 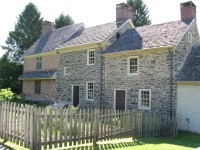 The project seeks to commemorate suburban Philadelphia locations associated with industrial heritage, civil rights and suburban development through theme tours, while not neglecting the county’s numerous Revolutionary War era sites. A volunteer developed list serve and website connects all organizations and promotes new programming. Volunteer teams are now working on cooperative projects that promote their communities and organizations. The panel includes Heritage Consulting Inc.'s client for this project, Jill Hall, Senior Preservation Planner with the Delaware County (PA) Planning Department, A. Richard Paul, Chairman of the Delaware County Historical Commission, along with Alexander Balloon a consultant at Heritage Consulting and Donna Ann Harris. Our session begins at 1:30PM to 3:15PM, please stop by if you are in Richmond. Contact us if you would like to learn more about this project.